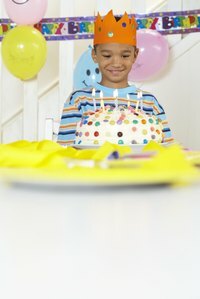 For an extra special birthday party or other celebration, you can add your own personal touch by hanging up wall decorations. The wall decorations can vary from signs and posters to banners to balloons and crepe paper. When hanging these decorations on painted walls, then the tape can do some pretty heavy damage to the paint unless you’re very careful while hanging the decorations and about the type of tape you choose. Hang decorations from unpainted surfaces, such as wood trim, whenever possible. The part of the wall that’s most likely to get damaged is painted surfaces. Opt for poster hanging tape, rather than standard tape. You can purchase this item at craft stores or party supply stores. It’s less sticky so the possibility of pulling paint from the wall is decreased. Specialized adhesive tape strips that pull cleanly from painted walls are also available -- meant to support weights from a few ounces to several pounds. Use the tape sparingly. When hanging the decorations, try to use small pieces of tape and the minimum amount you need to keep the decorations up. Pull off the tape very carefully when you’re taking down the decorations. If you pull it off hastily, you’ll be more likely to take paint off with the tape.